My inner nerd is delighted that Queen Elizabeth II chose a spacewoman as her new governor general of Canada on Oct. 2. Julie Payette was previously an astronaut with the Canadian Space Agency, flying two space shuttle missions and working at mission control in Houston. After her space career, among other things she worked as the chief operational officer of the Montréal Science Centre. In her new job as governor general, she is responsible for many of the functions of the head of state. 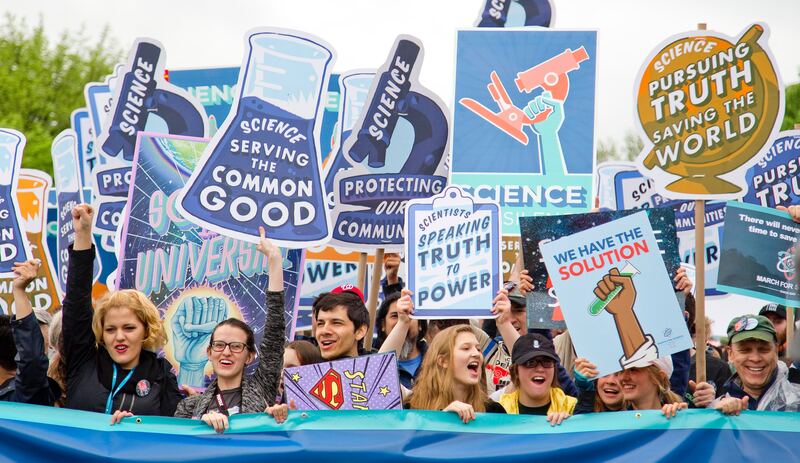 Ms. Payette has been praised by Prime Minister Justin Trudeau and others for her frank defense of the importance of science but also criticized for mocking the religious beliefs of many citizens. Rarely does a speech from someone who is supposed to be scrupulously nonpartisan reverberate so loudly in the Canadian media. But how should a Catholic assess Ms. Payette’s comments? Ms. Payette, the new governor general of Canada, has been criticized for mocking the religious beliefs of many citizens. It is hard to know exactly what she meant. Was she referring specifically to the origin of life itself billions of years ago—which is in fact still not understood by science—or more generally to the evolutionary process which shaped present-day life? Further, what is the significance of her distinction between “natural” and “random” processes? Without more specifics, we can only comment on the notion that divine intervention is at odds with scientific explanation, but there are some points worth making. For now, let us restrict ourselves to the question of the evolution of life. The church is clear that the sciences should explore the development of life, but without claiming that God is absent from the process. At this point we can run into trouble if we simply state that religion and science must “coexist” or only say that they are “compatible.” While such formulations are by no means false, they make it sound as though it is a game of give-and-take—as though science explains some bits of the development of life, but other bits are performed by God. They could lead people to think that God is just another physical agent in the process, only one that is for some reason hidden from the scrutiny of science. The traditional distinction between “primary” and “secondary” causality is what is relevant here. God is the cause of everything in the cosmos because he is the Creator. By creating out of nothing, he holds everything in being. Furthermore, by creating through his Word he imbues the universe with intelligibility and order. This means that cause and effect really do exist in the physical world—that, for instance, natural selection can be a real cause of the development of biological life. God as Creator is the primary cause, and the causes in nature are secondary. This does not mean that secondary causes are otiose or illusory. Without them, nothing would happen in the world. It is the way God has chosen to make our universe tick. In one sense, natural causes operate independently since they do not need God to poke his finger into things and make continual adjustments. In another sense, though, they are not at all independent, since their existence, rationality and ultimate purpose always depend completely on God. None of this is to say that there is no such thing as miracles or actions of God that appear in some sense to suspend scientific laws. But tackling the topic of miracles would be a much longer discourse and is not what I am interested in getting at here. The point is that the Christian conception of God’s guidance of the material world is not at all a hindrance to scientific literacy, as Ms. Payette may have meant to suggest. In fact, it is a lack of philosophical and religious literacy that leads to the notion of a zero-sum game: God or science. In reality, God is the ultimate grounds of the principles and causal structures necessary for biology or any other science to work and unfold. God is not in competition with science. He makes it possible. There are several unexplained things in our universe, mainly the origins of various phenomenon. And Science has no clue about these origins and apparently Ms. Payette has not a clue either. First, the origin of the universe itself with its precisely controlled laws that enable a functional universe and the thriving of life. Just incredibly small changes in many of the physiological constants and no universe that is functional could arise. We know there are four basic forces in nature but we have no idea why these four forces work together so well to form our universe and hold things together. They are extremely fine tuned to do so. These forces explain an awful lot of what we see but not everything. The amount they can explain can lull one into a complacecy that everything is explainable using these forces if we just find out how. This by the way begs the question of just why the forces are why they are so precise to ensure good things happen..
Second, the origin of life which is one of the most complicated phenomenon in all of existence. No one knows how to exactly define life but all admit it has several thousand interlocking systems that are necessary in order to exist. Nothing the four basic laws of the universe seem capable of creating. The information that governs life in incredibly complex. Take the most complicated computer program you could find and life is more complicated. No one would dream to posit that this computer program arose from random processes. Third, the origin of major biological systems that are more complex than any man made system known. These systems are based on thousands of inter-dependent and precise parts (mainly proteins) which have no known method of origin. For those who think that Darwin's ideas explain everything, Darwinian processes do create change but only minor ones. Does anyone out there believe that one could get Microsoft Excel by random changes to Microsoft Word. Fourth, the rise of consciousness and the ability to perceive our universe. No one can explain how this happened. What they do know is that humans have elaborate control mechanisms governing the DNA that lead to thousands of proteins associated with the neural network in humans. How such a control system arose is a mystery. Fifth, the Earth is extremely finely tuned to promote life. Slightly smaller and there would be no oxygen or water vapor to enable life and slightly bigger and there would be all sorts of poisonous gases preventing life from arising. Also slightly further away from the sun and all would freeze and slightly closer to the sun and the temperatures would be not conducive to life as we know it and the sun's radiation would probably kill all life. Look at the sky and see one of the most exquisite physiological systems in the universe, but we take if or granted and write romantically about it. It is the water transportation system, consisting mainly of clouds, that transfer water around the planet. Without such a system, it is doubtful any significant life could exist for long and it couldn't exist if the Earth was a slightly different size. There is more than a silver lining in those clouds. So science while almost miraculous in some ways can not explain how life arose or a lot of other phenomenon. Is Ms. Payette ignorant? I believe so and she should study the science and its limitations on many issues, mainly origins. Most excellent reply, it aligns with science and all my study has revealed, I almost thought that I had written it. What I find most disturbing is the seeming duplicity, clear equivocation, and esoteric obscurantism that is being used to lead so many, apparently Ms. Payette, to trivialize what they do not understand, embrace the ideological philosophical naturalism, believe the manipulative misinterpretations of scientific data, and expand the divide between the science and faith communities, which should be much more integral. Payette is in a political office and not as a scientific advisor. Payette demonstrated her immaturity and unsuitability for her office. I would suggest, as a Canadian, that her outburst was perhaps due in part to a lack of diplomatic experience and was also a reaction to Quebecor culture, which for decades has been steeped in a form of Catholicism that more recent generations have sought to discard. Odd that someone with her intellect would fail to recognize that the position she holds is ceremonial, largely irrelevant and is in itself a target for mockery. We can hope for a more conciliatory approach... but for the most part the position and statements issued from it are inconsequential. Thanks, Adam. The primary/secondary causality distinction seems so obvious to me that I'm baffled that scientific thinkers don't see it for themselves. (Analytical philosophers touch on it when they make the distinction between actions and events.) The habit of binary thinking may have something to do with setting up the perceived dichotomy between faith and science. Addressing philosophical illiteracy, however, is child's play compared to addressing theological illiteracy, which in its way is as endemic among Catholics as it is among atheists. My heart could weep over what often passes for adequate teaching in catechesis and homiletics. By the way, Christians and Catholics have one especially destructive habit of binary thinking. We see it in the false dichotomy we set up, historically with malice, between Jewish law and Christian love. I've yet to hear a homily that notices that the dichotomy collapses in plain sight when Jesus affirms that love of God and love of neighbor are the two most important---yes, laws. Much corrective conceptual work to do, in all directions. My 8 and 9 year old students want to know how they could believe in the Big Bang theory and also, believe in God. It seems they are sometimes challenged about their spiritual beliefs not being in line with their scientific beliefs. I told them about the Hadron collider and the God Particle. They had mouths agape when I explained the work of the collider to them. Religion and science can co-exist peacefully and as a retired science/mathematics elementary school teacher, I am up to the task of presenting all of the relevant information to the children and open the floor to questions. The spiritual and intellectual needs of our students need to be considered when we teach Religion and Science to them! What we believe in our hearts, our brains and our souls have equal value and make us who we are in society. To inform children of different belief systems is just as important as learning how to develop theorems and/or hypothesis! The "Big Bang" theory was called the "Catholic" theory of the universe since it so closely reflects Genesis and was developed by a Catholic priest. Georges Henri Joseph Édouard Lemaître was a Belgian Catholic Priest, astronomer and professor of physics at the Catholic University of Leuven. He proposed the theory of the expansion of the universe, widely misattributed to Edwin Hubble. He was the first to derive what is now known as Hubble's law and made the first estimation of what is now called the Hubble constant, which he published in 1927, two years before Hubble's article. Lemaître also proposed what became known as the Big Bang theory of the origin of the universe, which he called his "hypothesis of the primeval atom" or the "Cosmic Egg". No person has total knowledge of their discipline. While Payette may have achieved a lot, she however has limits to her knowledge and expertise. She has done a disservice to scientists by her attitude and her statement mentioned in this article. Her office is political and ceremonial. She is not there as a scientist. She shows a lack of maturity by her comment. Adam D. Hincks, S.J., an astrophysicist, is America’s contributing editor for science.